Great Britain made a remarkable scoop of the two top places in the women’s Fleche Wallonne on Wednesday, with Emma Pooley (Cervélo) scoring a lone victory ahead of three-times winner Nicole Cooke (GB). Pooley took off on the steepest section of the Mur de Huy on the second and definitive ascent of the notoriously tough final climb, a little earlier than instructed but which ensured she could celebrate the fourth World Cup win of her career in style. Sixth in the same event two years ago, the Cervélo rider said later that her team had been responsible for her coming to the Mur as rested as possible and ready to strike. Pooley’s victory ends Dutchwoman Marianne Vos’s three-year stranglehold on Fleche Wallone, and is the fourth British win in the race’s 11 year history. 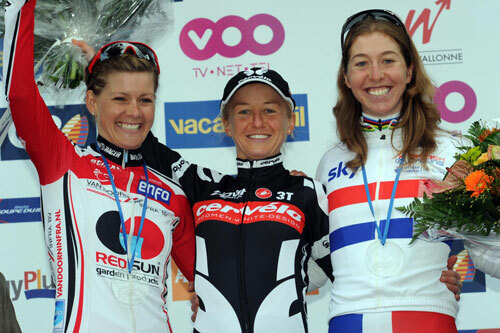 It’s Pooley’s first big win of 2010 after taking a series of high-profile victories in 2009 including the Grande Boucle, the women’s Tour de France. La Fleche Wallonne Feminine is the fourth round of the nine-round UCI Women’s World Cup road race series. Current World Cup leader Marianne Vos (Netherlands) came home in sixth. The win moves Pooley up to fourth in the World Cup standings, with Cooke in fifth.